With so many emails inundating our inboxes these days, it’s even more important than ever that your emails are different to everyone else’s. You want your emails to be something that your subscribers look out for and are keen to read and engage with. The best thing is that this isn’t difficult to do. Follow these simple steps below and your emails will be something your subscribers are looking out for. One of the most important things you can do to get more engagement from your email newsletter is to simply show that you understand your readers. After all, you do understand your readers, don’t you? This starts with having an ideal customer avatar that represents your ideal customer. Then get to know that ideal customer – their goals, wishes, desires, fears, challenges. What do they want to achieve? What’s stopping them from achieving these goals? Where do they live? How old are they? What sort of lifestyle and values do they have? Once you’re clear on who your readers are it will become much easier to write content that is of benefit to them. This then means that they’ll be more inclined to engage in your email newsletters. Many people underestimate the power – and importance – of the email subject line. To stand out from the crowd and make sure that your readers are engaging with your email newsletters, make sure you put the effort into crafting an effective subject line. The job of the subject line is to grab your readers’ attention from in amongst all the other emails they’re receiving every single day and encourage them to open the email. Grab attention … open email. Once the email has been opened, then it’s over to the email content to do its job. An effective subject line needs to be short and punchy, without any unnecessary words. Anywhere between 6-10 words tends to work well. A subject line that invokes curiosity is good, such as asking a question that your reader will need to read the email in order to discover the answer. Including personalisation such as your reader’s name in the subject can also encourage them to open it. 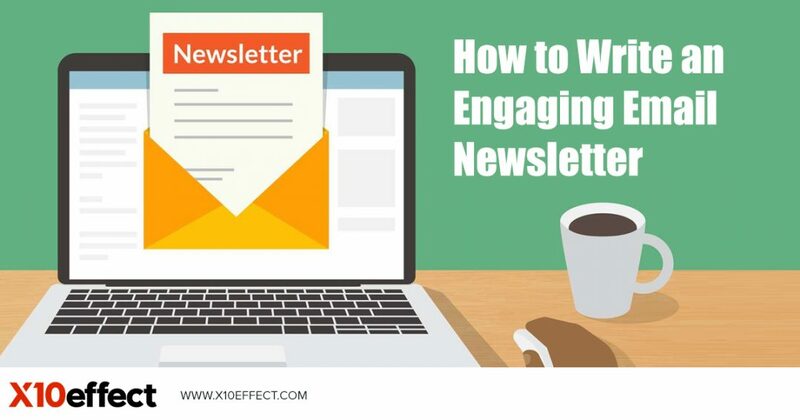 Before you start writing your email newsletter, make sure you know what the goal of that newsletter is. Is it to share updates about your company or business? Or perhaps this email’s goal is to get readers to read your blog article? Or is this a marketing email, where you want people to buy a product, register for an event or training or buy someone else’s product that you’re recommending? Whatever the reason, you need to focus on only one clear goal for each email newsletter. Relevance is a huge factor when it comes to email newsletter engagement. The more relevant your email content is for your readers, the more likely they are to read it. A good way to keep your email content relevant is to understand what your readers want and provide information that helps them achieve those goals. This is where the first point in this article – Know Your Readers – is vital. You can also use segmenting within your lists to divide your subscribers and customers into smaller groups based on their specific situation. For example, if you have segmented your subscribers into classifications such as Beginners, Intermediate and Advanced, then you could send different versions of your emails to each segment, making each version more relevant to that particular group. We live in a very busy world and most people have no shortage of information being thrown at them day after day. There’s no point sending emails to your subscribers just because you know you need to be keeping in touch with them. Yes, you need to send regular emails … but they MUST BE WORTHWHILE. If you don’t have any worthwhile updates or news to share, find something. Perhaps there’s a book that you recently read and found helpful and that’s relevant to your subscribers. If so, share your review and recommendation on that book. Perhaps you can find an interesting and relevant video on YouTube, or some useful statistics that have just been released. Or maybe you could email your subscribers asking for their feedback and questions. This is a good way to find out more about what they would like to hear from you in your email newsletters, then you can write about or create a video (or product!) to help with that. If you consistently provide worthwhile content in your email newsletters, you’ll find that your subscribers not only engage with your emails, but they start to look forward to seeing them in their inbox. Let’s face it, there’s no shortage of boring information online. It’s important that your emails don’t fall into this category. If it’s appropriate for your readers, add a little humour to your emails. Include some images or GIFs (animated images), or even some more personal photos such as of yourself at work, your team, your store, your desk. Images can make a huge difference in keeping your readers’ attention. Also, don’t be afraid to let your personality shine in your email newsletters. That might be your own personality, that of your team or staff, or your brand personality. Gone are the days of trying to be “perfect”. Everyone knows there’s no such thing as perfect, so there’s no point in pretending that you are. Let your little imperfections show from time to time and people will be able to relate with you better, and they’ll appreciate you all the more for it. Another way to boost your email engagement is to make sure that your emails are easily readable. Keep them simple – both the language and the design. Emails that are written with lots of fancy words that your subscribers find difficult to relate to or that have cluttered designs with too many colours are not going to be read. Make sure you write in simple, clear words that your ideal customer avatar uses and understands. Also, include plenty of white-space around your text so it’s easier to read, and don’t have long paragraphs that go on and on and on. Formatting your text with some italics and bold text, where appropriate, to make those points stand out or using bullet points is a good idea too. All these suggestions will make it easier for your emails to be read, and the easier they are to read, the easier they are to engage with. If you’re not already doing all of the points suggested above, make an effort to start doing them from the very next email you write. You’ll find that your email engagement increases significantly, which in turn will boost your profits. Trim your overuse of THAT. It’s a fluff word Which adds no value. This email has SIX you can do without.